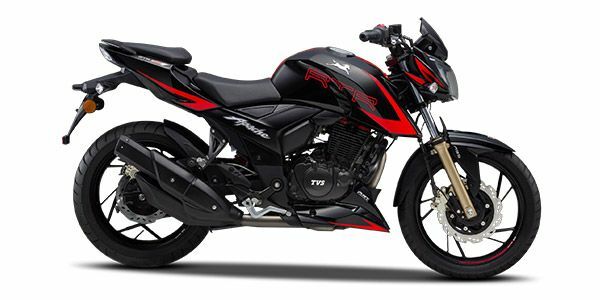 TVS will soon be launching its fuel-injected Apache RTR 200 4V variant with ABS, They had earlierintroduced a new range of colours for the RTR 200 4V Race Edition 2.0 :grey-yellow, red-and-black, white with red and matte black with red graphics. The latest version of the RTR 200 4V Race Edition 2.0 gets a host of updates such as a flyscreen and a slipper clutch that TVS likes to call an anti-reverse torque unit, which reduces clutch effort by 22 per cent. It also helps with quicker upshifts and reduced wheel hopping during aggressive downshifts. It is also the only bike in its segment to offer a dual-channel ABS setup. For a more detailed Road Test Review, you can click here. TVS Apache RTR 200 4V Race Edition 2.0 prices start at Rs. 97,005 (Ex-Showroom) and the top end variant TVS Apache RTR 200 4V Race Edition 2.0 ABS is priced at Rs. 1.11 lakh (Ex-Showroom). TVS Apache RTR 200 4V Race Edition 2.0 is available in 4 variants and 5 colours. Share your experiences with Apache 200 4V Race? The claimed ARAI mileage for the TVS Apache RTR 200 4V Race Edition 2.0 petrol is 44 kmpl. With huge improvements in style, performance and handling, the Apache RTR 200 comes across as a refined, well-finished entry-level performance motorcycle that's also priced well, and, though a bit late to the party, is a worthy upgrade for RTR 180 owners. Q. Is this bike better than Yamaha FZ 25? Q. When fi with abs variant of apache rtr 200 4v racing edition 2.0 is launching? As of now, there is no official news for same. Stay tuned to ZW for further updates. Q. I am planning to purchase a new bike. Which one should I consider? I've narrowed my research to Bajaj V15 Power up and Apache RTR 200. what are your suggestions? which one is better? There is no comparison between v15 and RTR 200.But its all about on your needs, if You need to buy a daily commuter bike then go for v15. Q. Can we install ABS in matte red? U can but the cost of installing will be too high as compared to factory fitting. Q. Pulsar NS200 or Apache RTR 200 4V or FZ 25 for Better cruise and Long drives without much pain? For 2018, TVS has updated the RTR 200 with a lot more than just new colours. We find out how these upgrades have affected its overall performance in the real world. We pit the Apache RTR 200 Fi against its carbureted twin to find out if the addition of a fuel-injection system has truly made a world of a difference. The TVS Apache RTR 200 4V Race Edition 2.0 gets some impressive design highlights, like the offset fuel lid and the air ducts on the fuel tank, which help channel the airflow for better engine cooling. While the basic design language has remained unchanged, for 2018 the Race Edition gets new colours - Black, Grey, Red and white. You also get sharp looking graphics and minimalistic cowl covering the all-digital instrument console. The console is loaded to the brim with details like lap timer, acceleration timer, fastest speed recorder, service indicator, shift light indicator and gear indicator. Powering the TVS Apache RTR 200 4V Race Edition 2.0 is a 197.75cc, oil-cooled, single-cylinder motor that develops 20.5PS (Carb) and 21PS (Fi) at 8500rpm, with 18.1Nm of torque produced at 7000rpm. The engine comes coupled with a 5-speed gearbox and slipper clutch, which is a first in 200cc segment. Its double cradle frame is suspended on telescopic front forks and a monoshock unit at the rear. The bike comes with stock TVS Remora tyres but you do get the option of wrapping the 17-inch wheels with Pirelli tyres. The RTR 200 4V Race Edition 2.0 gets a 270mm front disc and 240mm rear disc for braking, with first-in-segment dual-channel ABS. The ABS variant is available only with the carb variant and at a premium of Rs 1000 over the Fi variant. Bajaj Pulsar NS200: In our comparison test with the TVS Apache RTR 200 4V, the NS200 came across as a well-balanced package that’s ideal for your daily city runs, occasional highway cruising and even for some fun on the twisties. The Bajaj Pulsar NS200 offers a lot more grunt, better-stopping power and well-balanced ergonomics in comparison to the TVS Apache RTR 200 4V. It also feels a lot more relaxed at high speeds. Yamaha FZ25: The Yamaha FZ25 is a good option for someone looking for a daily commuter. It’s a lot more welcoming for tall riders as well, when compared to the TVS Apache RTR 200 4V. Being a Yamaha, the FZ25 will prove to be reliable in the long run, looks smart and is a lot more frugal in the city. But the engine feels stressed at high speeds. Moreover, both the brakes and tyres don’t inspire confidence under hard braking either. The TVS Apache RTR 200 4V is a comfortable city bike with plenty of grunt and agility for a quick race off the traffic lights and to tackle some twisties as well. But the engine feels too strained out on the highway. Also, ergonomically, with the high-set footpegs it’s a tight spot for someone taller than 5 feet 10 inches. Even the brakes fail to inspire confidence under hard braking. Luckily though, TVS does offer ABS as an option. But then, the Bajaj Pulsar NS200 also gets ABS, a single-channel unit. Apart from that, the Bajaj is also a more well rounded motorcycle that does everything just right. The ride quality too is better on the Bajaj. So, if your daily riding consists more of city commutes, the Yamaha FZ25 or the TVS Apache RTR 200 4V is the way to go. But if you are looking to ride your bike out on the highway as well, the Bajaj Pulsar NS200 is a more potent tool to opt for. only 20.5bhp which is very less for a 200cc bike. Best in class styling with fantastic mid range and refinement. Handling is superlative (with pirelli tyres). Braking could do with more initial bite. Such a wonderful bike. I love it so much. Confused about TVS Apache RTR 200 4V Race Edition 2.0?